I have SUCH a cute book to share with you today! You know me – I always love a good true animal story with a happy ending 🙂 I’ll just warn you in advance that I went hog wild with the photos 🙂 Enjoy! Opening: “The fawn lay still and quiet. She was alone and afraid as she waited for her mother to come back. Every little deer needs its mother to protect it from the many dangers of the forest. Brief Synopsis: When a fawn is abandoned by her mother, a nearby couple takes her in, hoping to save her. 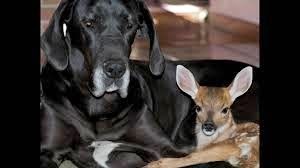 Their Great Dane, Kate, though she has never had puppies of her own, knows just what to do to raise a baby deer. PPBF bloggers please be sure to leave your post-specific link in the list below so we can all come visit you! I always look forward to each new week’s list of fabulous books! I love stories about unlikely friendships. Koko and kitten… and now Kate and Pippin. 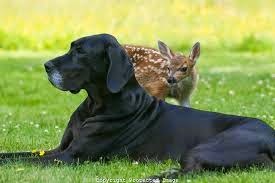 If different species can become friends, it gives me hope that people can become friends with others who are much different than them. It also helps explain why we love our companion animals. Wonderful that they were able to capture the unfolding of this relationship in photos so that we too can marvel at what nature knows better! Thanks for sharing it, Susanna! AAwww! So cute! I Just LOVE unlikely friends and this lesson that families come in all kinds of ways is so true. Reminds me of a viral thread I put on my Edmund Pickle Chin facebook page. I love this book! We keep seeing stories about unlikely animal bondings. Thank you for sharing. I love animals books, too! This one is lovely, Susanna. Somehow I posted my PPBF twice…I don't think I can fix it, but I'm sure you can. 😉 Happy May…Happy No Snow…Happy Writing, everyone! The pictures are so sweet. People can learn so much from watching animals relate to each other. Okay, I definitely want to read this book. But even more than that, I want Kate!! Or another Great Dane of my own (wouldn't want to take their gorgeous dog away). Not sure how my own pooches would feel about adding another one to the mix, but they're such noble and beautiful dogs, aren't they? 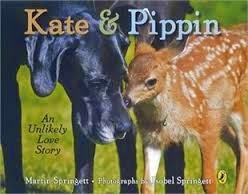 Kate & Pippin looks like a great find, thanks for sharing it with us Susanna! But… You really take the cake for sharing the video with mama cat taking in a baby squirrel, Amazing! I just got a little teary-eyed reading about this story. 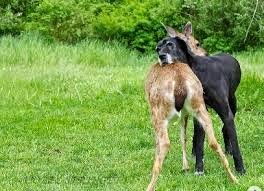 You can't help but love different animals bonding, building relationships, and the happy ending of that relationship being a life-long joy to behold. well this is weird – I linked Spectacular Spots on Friday Morning – but it somehow fell off the list. so here it is again, a bit late…. This is an AWESOME book. 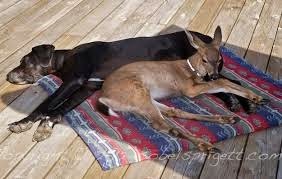 I love reading about animals that are unlikely friends. I saw an elephant and a dog, a tiger and a cat, a horse and a kitten – this is very sweet. 🙂 I'll have to look for it!